Territory). Official Website for this Army Recruitment Rally Neyveli is Www.joinindianarmy.nic.in. Apply online from 09-04-2019 to 18-05-2019. Recruitment Rally will be conducted at Nevyeli from 07-06-2019 to 17-06-2019. 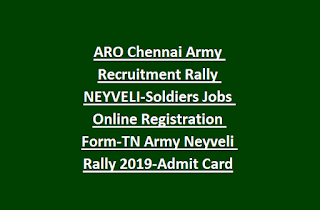 Admit Cards for this Nevyeli Army Recruitment Rally will be available after 20-05-2019. Eligibility criteria, selection process, age limits, online application process and other details of this Army Recruitment Rally Neyveli is updated below. Age limits are 17 ½ t0 23 years for Soldier Posts. For Soldier GD 17 ½ to 21 years. Selection for this Army Soldier posts will be through Documents verification, Physical Standards Tests, Physical Efficiency tests and written exam. 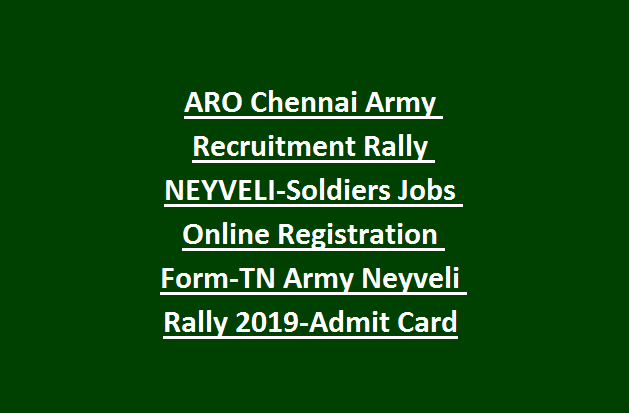 Online application for this Army Recruitment Rally Neyveli will be accepted till 18-05-2019. Official website to apply online is www.joinindianarmy.nic.in. Admit Card for this Neyveli Rally will be available from 20-05-2019.